How long does it take before a recurring event becomes a tradition? Is there a “tradition benchmark” that has to be reached for qualification? Does the intention to repeat something every year qualify it in advance? The reason I ask is this. Last year my buddy Johnny and I met up for a wander around the Patch just before Christmas and later I documented our seasonal walk in a post to this blog (if you want you can read it here). As we enjoyed it so much we arranged to meet up for another festive walk this year. We now plan on doing this each year if we possibly can. So do 2 walks and the promise of more make a tradition? Who knows, but one thing is for sure we had a fine old time this Yuletide. 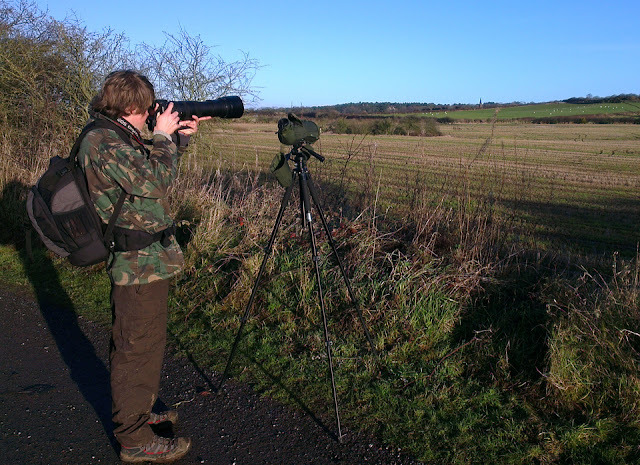 Mud, sun, cameras and birds – ‘nuff said. Our walk actually starts with a bike ride. We are low carbon photographers, neither of us currently own a car, so we spin about the Patch on foot or using pedal power. I text John to say I’m leaving. His reply is“race ya”. Game on! Now in my defence John has several years on me, his bike has 18 gears to my 3 and his route to our rendez-vous is mostly downhill…. However to my surprise (and probably yours) I arrive first, beating John by (in my opinion) a mammoth 30 seconds - a point that I am all too quick to impress upon him. Bikes stowed away we set off for a relaxed stroll about the peaceful but muddy paths of the Patch, the gentle countryside an antidote to the mayhem and concrete of recent Christmas shopping excursions to city centres. As we amble along we talk about many blokey subjects. First, we compare injuries from (mis)adventures, some recent others from the dim and distant past. Here Johnny trumps my partially severed finger with a spectacular broken leg suffered falling off a log in Harrock Wood a couple of years ago. As we chat we take pictures of whatever comes our way. Nothing out of the ordinary and we don't get close to anything, but it is just great to be taking pictures. In the waterlogged grain fields that flank the Wirral Way there are hundreds of pigeons feeding on the crops the farmer has been unable to collect due to the saturated ground. 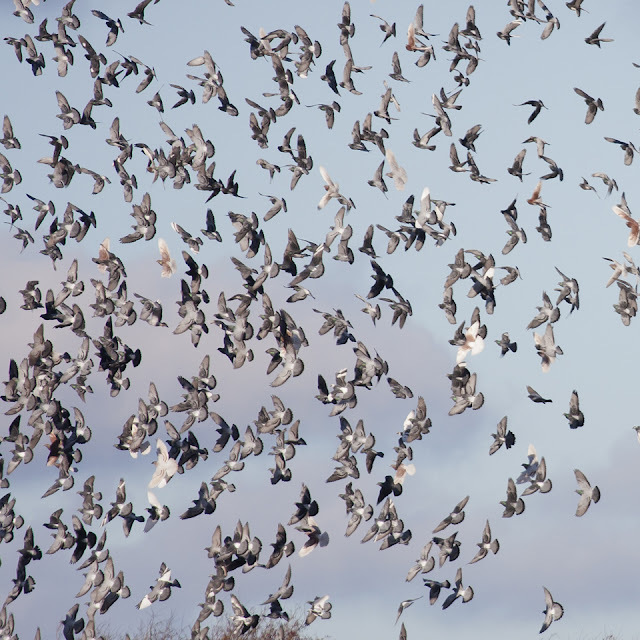 They explode into flight at the merest whiff of danger wheeling around us in a loose flock. In amongst the mix of Woods and Ferals is a single pure white dove, the more spiritual reader may attach some seasonal significance to this. From the Pigeon Field we pass the meadow we have recently come to call mini Martin Mere (MMM). Being of a heavy cley soil and with the recent deluges it is essentially a sloppy mud bath. Not all of the crop it contained had been harvested as the combine became embedded in it’s North West corner for a couple of weeks, and no new crops have been sown allowing hundreds of geese, ducks, pigeons, crows and waders to take advantage of a free feed. As we pass by MMM we discuss what would be in our fantasy camera bags. It is fair to say we aren’t the richest gentlemen in these parts so the chances of these wishes being granted are slim but we indulge ourselves nonetheless. (Out of interest Johnny is dreaming of a Canon 6D and a 100mm macro lens while I am hankering after whatever is going to replace Canon’s 7D. We both would love to get our hands on a 300mm f2.8 lens plus a 2x converter). We mosey across Heswall Fields in the direction of the shore. 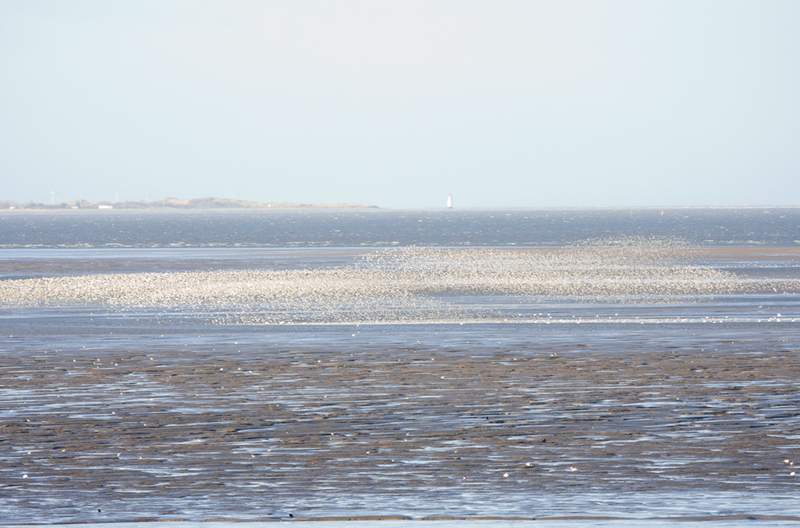 We have timed it so we arrive as the tide is dropping and the birds are returning to the replenished mudflats to feed. 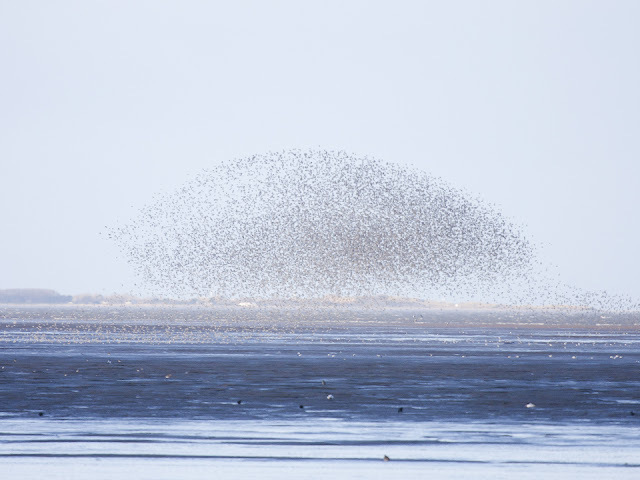 Our pace would best be described as“snail’s” but we are quickened by the sight of 30,000 Knot cart-wheeling across the mud. A hap-hazard dash across to the cliff top splashes filthy water everywhere. My jeans end up polka-dotted with mud. 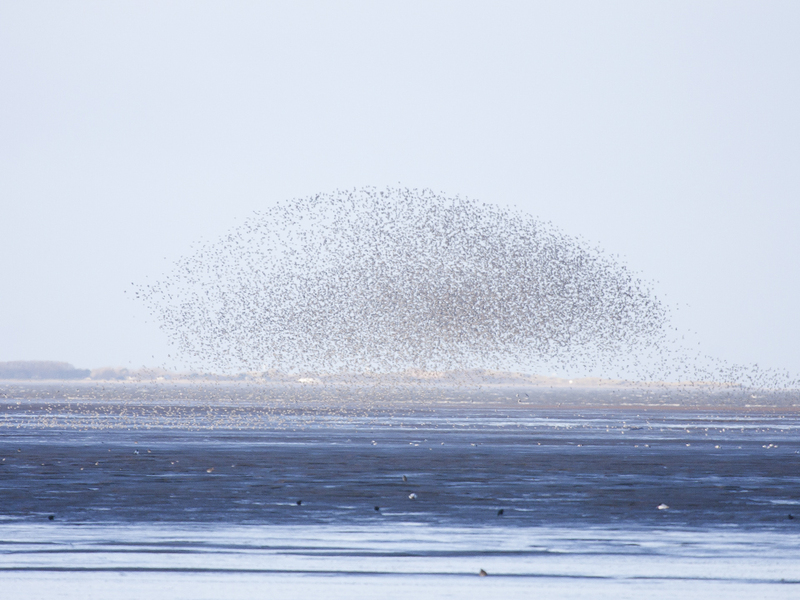 The Knot are still at their acrobatics and we try and record the action even though it is rather distant. Eventually they settle and peace returns to the flats. 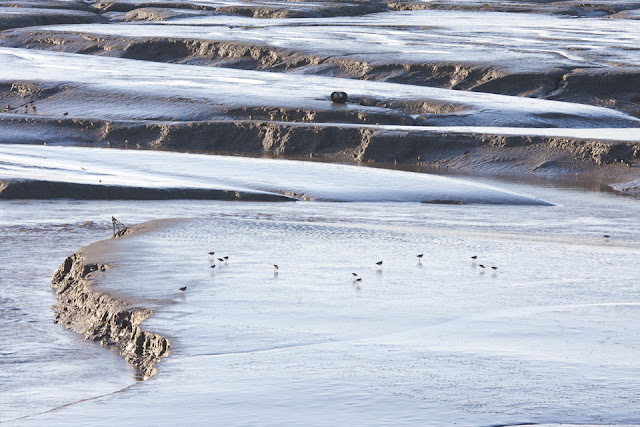 A clump of Redshank that had been sleeping in a tide-carved valley venture out on to the muddy plateau above their roost. Initially they remain in the tight group they roosted in, but slowly they string out like a cohort of covert troops on a patrol mission. They stalk the mudflats looking for amphipods risen to feed on the sediment surface. Our phones chirp with texted news of sighting up and down the estuary, clearly we are not the only ones opting out of the Christmas shopping frenzy. Some Curlew come out of the marsh and fly over our heads. It looks like they are heading for MMM. Johnny gets some cracking pictures, much better than anything that I have to show you. By now we have turned back towards our origin and are making our way back to the bikes. The memory cards in the cameras are filling up but there is time for a couple more shots before we end our festive jaunt. A dangerous and ill-advised climb up the rapidly eroding cliffs gets us back up to the fields by the Wirral Way. The sun, absent for days, is making the countryside feel luminous again. The colours have been transformed, greys are now silvers, beige is made golden. In a far field we see a bunch of Pink-footed Geese come wiffling in. 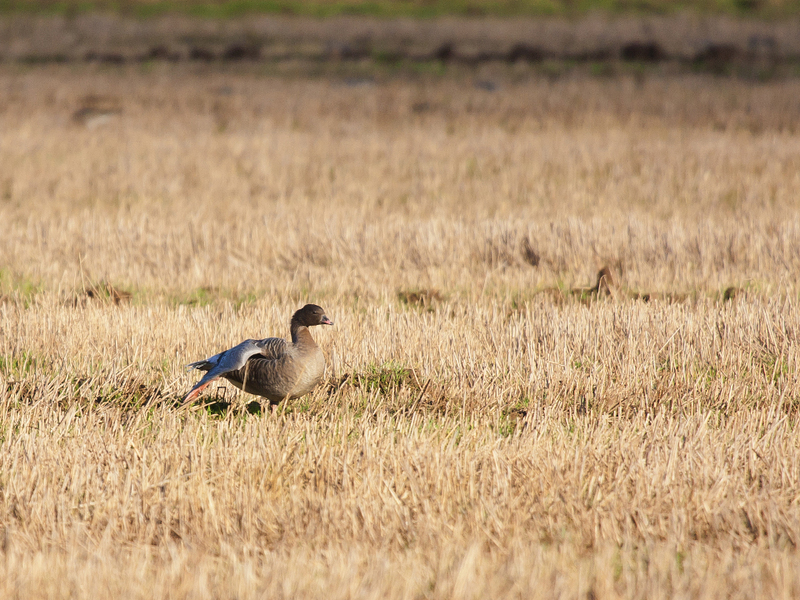 We stalk them; the geese waddle along looking fat from the grain. It occurs to me that one of these would go great with the cranberry sauce I made the previous day. But we shoot them with just our cameras. The pictures are a last reminder of a truly great morning about the Patch. After a warm exchange of season’s greetings we saddle up and zoom off. Johnny has a last minute gift to buy for his girlfriend and I am meeting my wife for her well established Christmas tradition, a reunion with school friends. Yet again the patch has done it. Mud, birds, light, friends. I pedal home feeling warmly content, feeling…. festive. Great writing and stunning photos Matt, a most enjoyable post and blog! What a great way to get into Christmas. Sounds like the Dee Estuary is a simply fabulous place to hang out in and wander about. Cheers and all the best from Australia.